Vicente del Bosque is considered one of the most respected head coaches featured in this summer’s tournament. The former Real Madrid skipper won just about any and every trophy he could at the turn of the millennium with the La Liga giant and the manager has continued his great success so far with the Spanish national team. In fact last summers Confederations Cup loss to the Yanks is del Bosque’s only loss as manager and the coach has been around since 2008. Spain uses an offensive minded form of the 4-4-2 with four back line defenders, two center midfielder and two wings, and two forwards up top. With the most impressive midfield unit seen in the Cup in some time it is no wonder that Del Bosque is a fan of a four midfield formation. Spain’s squad consists of the most depth and talent of any playing in this summer’s World Cup. Iker Casillas is considered by many critics the Cups best keeper and backup Pepe Reina could start for 90% of the teams playing this summer. The defense consists of the best center fullback tandem of Puyol and Pique and the midfield is the best of any in the tournament as well. 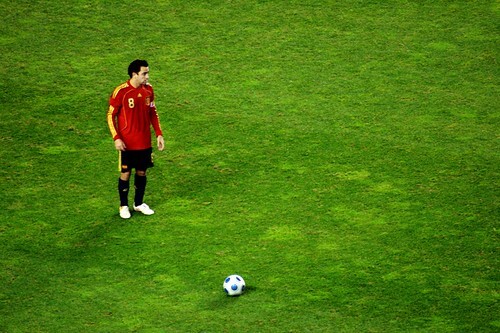 Xavi, Iniesta, and Fabregas should give opposing teams fits. And Torres and Villa up top assure that Spain is in a league of their own. Operation Numero Uno is quite simple. Spain must win their first ever World Cup. The team recently enjoyed a plus 30 game win streak and when that was snapped they reacted by winning out in the WCQ. But Spain knows that none of that matters anymore and the only thing that does matter is a World Cup victory. The Red Fury are considered by most the favorites to win the tournament and one Yank has to agree. Their team has no weaknesses on paper and so many fantastic offensive minded players that even Brazil has to be a bit jealous. Spain has the most flash of any team playing this summer, but do they have the overall strength and consistency to win it all? History says that Spain will likely get to the quarterfinals and choke, but their roster’s overall talent suggests that they might be ready to break the curse. Their recent play in exhibition matches certainly hasn’t assured that they will win and Fabregas’ late arrival back to form could damper their dream. Most of all though they are stuck in an underrated group with Chile and the winner and second seed will have to matchup with the Death Group in the second round which means they will likely have to play Portugal or the Ivory Coast if not Brazil. If Spain wins it all then the movie made about them should go by the title The Undefeated because, honestly, no team has a better chance of not losing a match. But if Spain disappoints once again this year in their supposed Golden Era then the team should be remembered by the film title Legends of the Fall.